A high quality pear but one needing a warm sheltered location. Raised by Goubault at Mille Pieds near Angers, France 1837. Medium sized, round conical fruit. 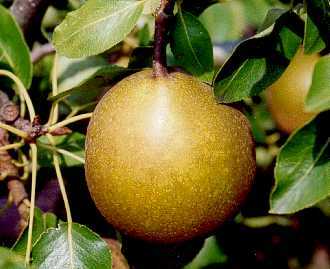 Rough, yellow skin with patches of light brown russet. Pale yellow, fine melting flesh. Sweet, scented flavour. Excellent dessert variety but also good for cooking. Moderate cropping. Best grown in a warm location.